Do you believe this gorgeous shot? Man-o-live what a beauty. Mike doesn't often repeat a "Branch of the Week" but with material like this, why not? Janolus barbarensis (previously Antiopella barbarensis) is the southern member of a strikingly similar two species complex found along the California coast. The northern species, Janolus fuscus (O'Donoghue, 1924) was only recently resurrected from the doldrums of taxonomic synonymy as an appropriately described and distinct species (Terry Gosliner 1982). While these two Arminacean nudibranchs do look amazingly similar, they are best separated by: 1) the large orange-red crest between the rhinophores in J. barbarensis (slightly visible in Clark's fabulous photo above), and 2) the branching of the digestive gland in the cerata of this species (seen here in perfect detail). Janolus fuscus has no crest, only a thin orange line down the center of the back, and the digestive gland is unbranched as clearly seen in Ron Long's photo in "Pacific Coast Nudibranchs", species 161, page 82. The ceratal colors vary somewhat in intensity in both species. In this specimen the yellow-gold sub-apical band is quite faint, as is color at the tip. In the typical specimen the sub-apical band is bright, almost metallic, and the tip of the cerata is darker blue. At first glance we thought this specimen was a J. fuscus, because of the very light tip coloration. J. fuscus, has white tipped cerata, rarely, if ever, blue. Named for its type locality, Santa Barbara, California, the ranges of the two species overlap somewhat in the central portion of the state, San Luis Obispo to San Francisco. It was this overlap that caused earlier taxonomists to think the two were just variations of a single species. Janolus barbarensis is known as far south as Bahia San Quintin, and from the Gulf of California. 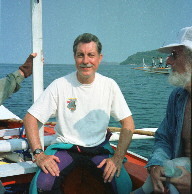 Tracy Clark was certified in 1986, a month after being certified he rented a underwatercamera in Hawaii and was hooked. His occupation is equipment operator. 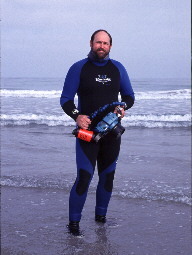 He dives mostly San Diego areas, plus a few trips to Hawaii. He has placed in the PCUPC photo contest, and also the San Diego Unions Nature and Eye photo contest. He has had photos published in the Pacific Diver magazine and also Espacio Profundo. You will find him at La Jolla Shores almost every weekend. 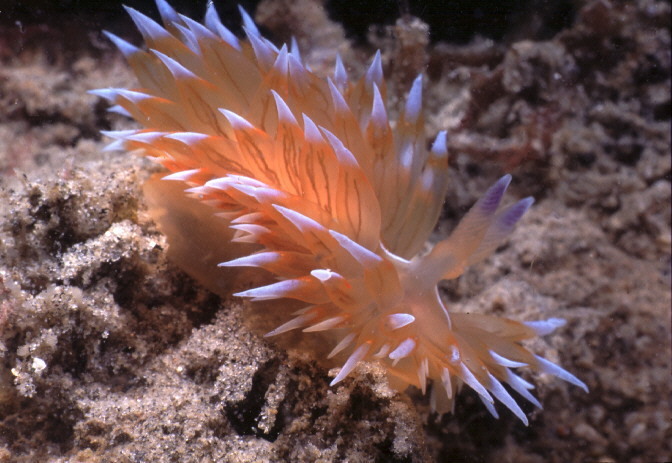 This nudbranch along with three others of the same type, was photographed at La Jolla Shores at about 55 feet deep on the canyon wall, at La Jolla Shores. This photo was taken with a Nikonos V, 1-1 macro, and dual MCD strobes, film Fuji Sensia 100.